The 1950s poodle skirt was a ‘50s favorite swing style with a poodle standing at the hem of the skirt, complete with a curly embroidered or sequin leash. Other decorations came in the form of the large applique cats, squirrels, guitars, or catchy phrases like “See You Later Alligator.” They were made of wool felt, a stiff fabric that didn’t reveal hoop lines underneath. It was also quite light and never wrinkled. The poodle skirt became a lasting icon of the 1950s especially for girls and young teenagers, but women wore them, too, with more mature appliques such as the Eiffel tower, telephone, and martini pictured below. Poodle skirts were paired with a sweater tops or button-down blouses, white bobby socks and saddle shoes- the same ionic look worn to Sock Hop dances. 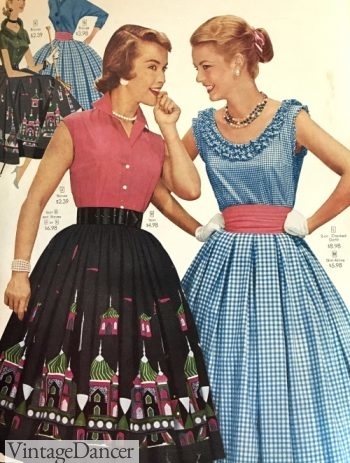 Learn more about the or shop poodle skirts here with even more poodle skirt history.